JOHN POWELL is no stranger to the thriller genre, having scored the likes of “The Bourne” Trilogy and “Green Zone” in recent years. 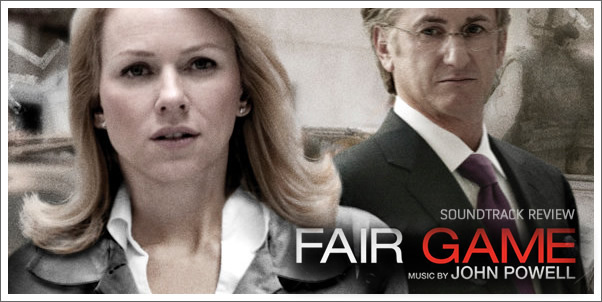 Therefore he finds himself in a familiar position with FAIR GAME, a political thriller that retells the story of former CIA officer Valerie Plame Wilson. In 2003 after Wilson’s husband, former Ambassador Joseph C. Wilson, had written a piece in the New York Times criticising the reasoning behind the Iraq War, Wilson’s CIA status was leaked to the press. This betrayal by the government led to what is now known as the Plame Affair. Finding himself in such familiar territory, JOHN POWELL could be forgiven for not producing the most inspiring score of his career. Powell’s music is undoubtedly suited to the film that it accompanies, but it does nothing to defy the conventions set out by previous thrillers and those set by Powell himself. Beginning with “Kuala Lumpur”, the score opens with a style reminiscent of Brian Tyler’s opening track for the 2009 film “Fast & Furious”, “Landtrain”. The rhythm of the percussion and electronic elements also serve to remind listeners of Powell’s previous efforts in the “Bourne” films. Building up to a sudden release, “Kuala Lumpur” works well as a statement of intent and comfortably settles the score into the typical thriller rhythm.